Hi, lovelies! Emma here. 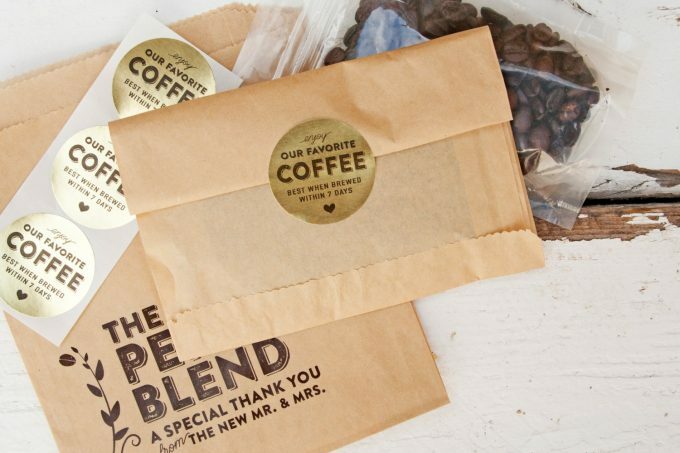 Today we’re talking about personalized wedding coffee favors and where to buy them. I was up too late accidentally watching a movie and now I’m two cups of coffee in and finally waking up. ;) Have you ever accidentally watched a movie? It happens when you’re scrolling through Netflix and click a button and mean to go back but then it starts to get interesting and, two hours later, you’re rooting for the guy to totally change his life and win back the money. (It was this movie and it was pretty good!) Anyways, back to coffee. I love coffee. 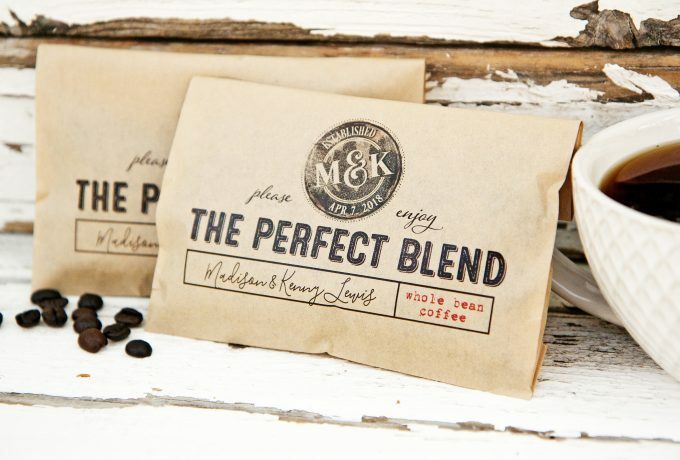 Coffee favors are one of the growing trends in weddings and for good reason — people love coffee, but even more, they’ll actually use coffee favors. 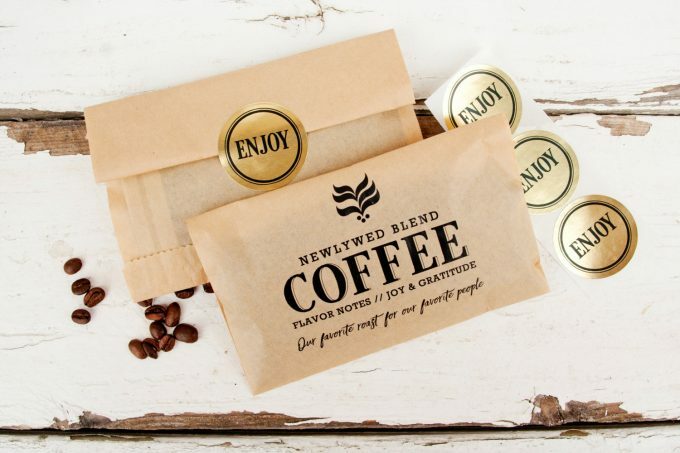 If you’re planning to give personalized wedding coffee favors to your guests but you have no idea where to find them, we’re here to help! One of our favorite coffee favor makers is Mavora Art and Design. 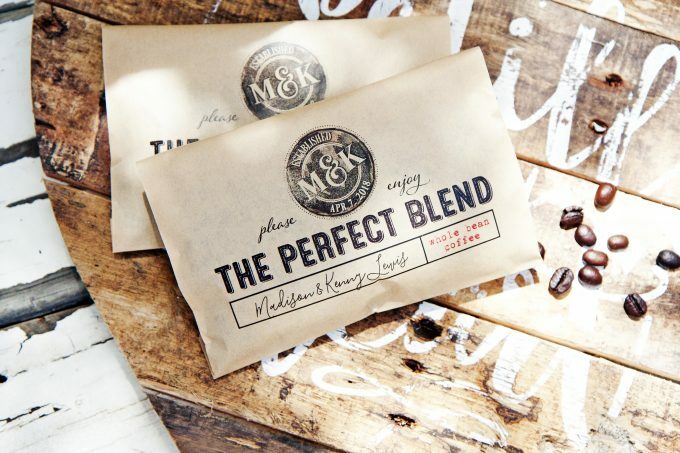 Abby has a serious eye for design and she makes some of the coolest personalized wedding coffee favors we’ve ever seen. 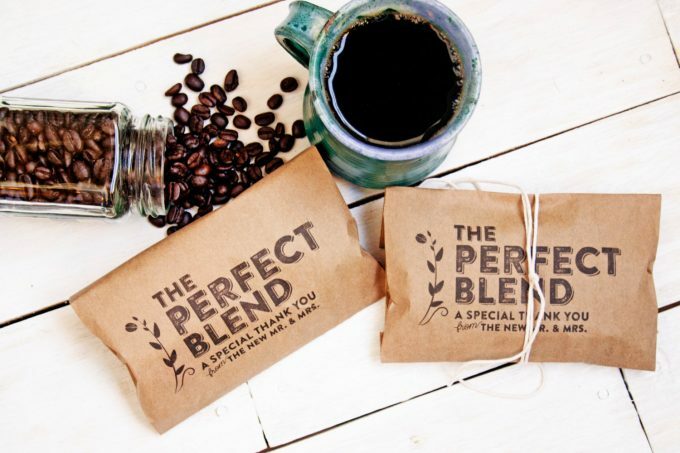 Some of her coffee favor bags include cute sayings like “Newlywed Blend” or “Perfect Blend” or even a custom location you pick like “Island House Blend” to really add a personal touch to your coffee favors. Take a look — you can even get an exclusive discount code for anything in her shop! Enjoy! This design is my favorite! Essentially, you’re getting two different favor bags: one for donuts and one for coffee. There is no better combination of treats, in my opinion! 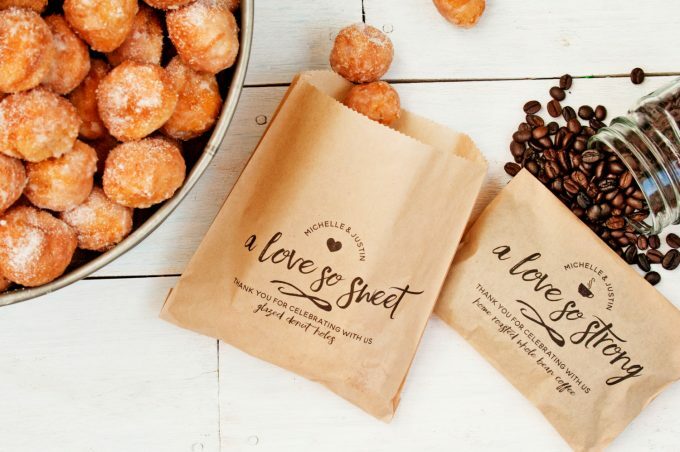 The personalized wedding coffee favors read, “A Love So Strong” while the donut bags read, “A Love So Sweet”. 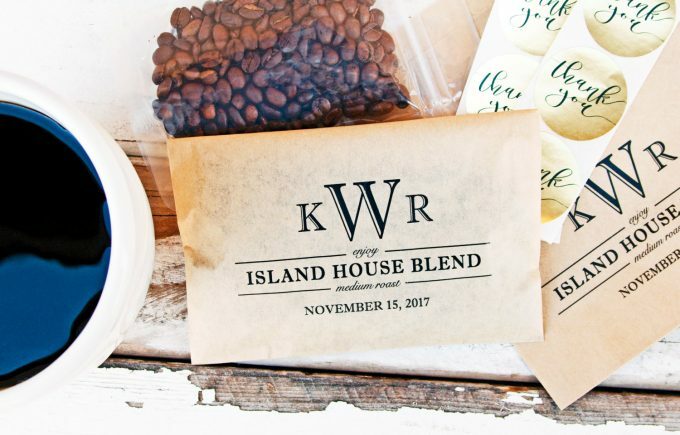 This next one — the Island House Blend — features personalized wedding favor bags that were made for a couple’s location. You can choose anything to go on your bags to add a personal touch. Great for destination weddings or state themed weddings, too, as you can even choose a design with your state. These coffee favor bags can be used for coffee OR tea. 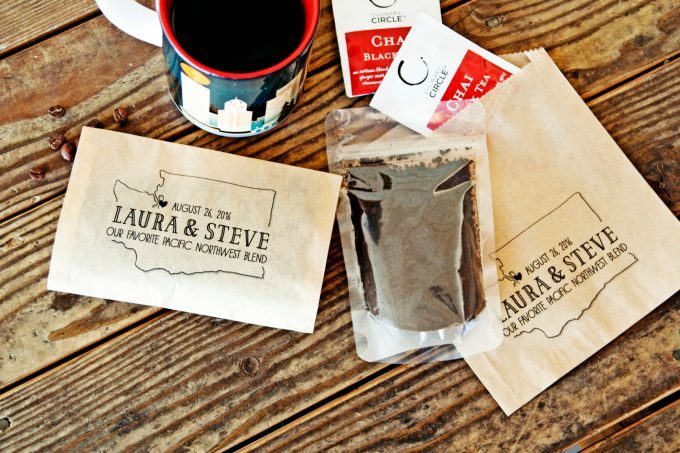 Here are some more from her personalized wedding coffee favor bags collection you’re sure to love. 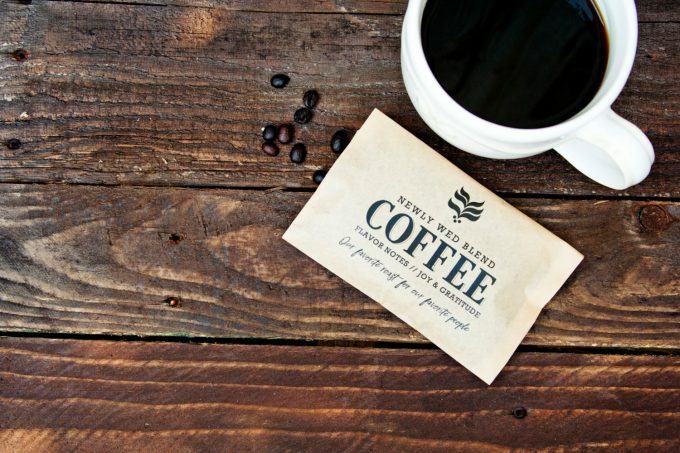 The grease resistant paper keeps your favors looking great; coffee bag inserts can be purchased separately to keep your coffee as fresh as possible. Love what you see here? 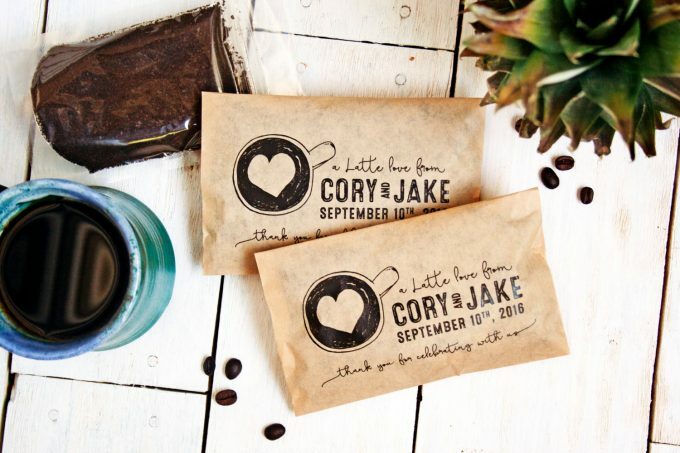 To get your own personalized wedding coffee favor bags, head over to the shop. Off to fill up my cup! P.S. There’s more coming up next — are you subscribed yet?